A few months ago I read a book called ' Football Manager Stole My Life - 20 years of the beautiful obsession'. A trip down memory lane ensued as I began to recall all the different versions of the game I have played over the years. I started off, like most, with the original series on the Commodore Amiga back in 1992 and came back year after year to buy the latest version of the game. In therapy terms, I had been doing really well in recent times. I had not touched the game in a number of years and I was leading a 'normal' life. But, after reading the book, my willpower finally broke. I reloaded an old version to my laptop, whilst at the same time vowing never to get sucked into playing into the wee hours like I did in my youth. 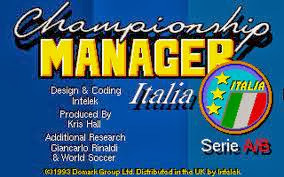 Then I remembered playing a version of the game which co-incided with the start of my passion for calcio in the mid 90's....Championship Manager Italia. Based on the 93/94 series of the game, this version was purely for the Italian leagues Serie A and Serie B. The format was exactly the same, you chose a team to manage in either league and were responsible for the buying and selling of players and winning as many games as possible to avoid the dreaded sack. A nice little twist on the potential buying of players meant you could try to buy 'foreign' star names like Eric Cantona, Alan Shearer or a youthful Ryan Giggs. Whilst researching this game I found an example of the Roma squad of that time which includes a 17 year old Francesco Totti and other big names stars from that era like Abel Balbo (age 27) and Aldair (age 28). Italian football was enjoying a golden age in the mid 90's and most of the teams had superstar names in their ranks who were at the peak of their in-game playing powers. The beauty of this game was in it's simplicity. The main screen was a series of boxes (eg Continue Season, Find Player or View Tables). Each box did exactly what it said on the tin, and as a result the experience of playing the game was very enjoyable. It all looks very basic graphically now, but this was like nothing I had experienced before in the Football Management gaming world. If memory serves, you also received a handbook which listed the teams and gave a brief history of each club for those gamers not familiar with Italian football. The most recent versions of the series (now called Football Manager) are packed full of information which has led to criticism that the game is no longer about the simple playability of the old versions like Championship Manager Italia. Technology has moved on but with the introduction of Amiga Emulators and websites dedicated to older games it is possible to download this (and other) games and enjoy the simple things once more. I hope you have enjoyed this trip down memory lane and it has rekindled your love of the Championship Manager series. Will you be tempted to dust that old copy off and have 'just one more game'.....for old times sake?